I just had to make dessert, so my contribution is Tishpishti (love the name, so I had to make it!). I did a version with ground walnuts and no almonds - cinnamon and orange rind/juice in the batter, and the soaking sauce was 1/2 honey and 1/2 sugar syrup (and lemon juice). So yummy! And in case anyone ever needs another spot for "traditional' gefilte fish ingredients, Robert's on Devon is a gem. They hack up the fish right in front of you, so you can judge for yourself if everything is fresh enough! Pound and a half ground combo (whitefish, pike & salmon), ground to order, and the heads and bones for stock. All for about $19. boudreaulicious wrote: And in case anyone ever needs another spot for "traditional' gefilte fish ingredients, Robert's on Devon is a gem. They hack up the fish right in front of you, so you can judge for yourself if everything is fresh enough! Pound and a half ground combo (whitefish, pike & salmon), ground to order, and the heads and bones for stock. All for about $19. Love Robert's. Picked up my ground fish on Sunday, having called in the order some time back. The price of whitefish had certainly jumped, but they had it. I wish I had known how rare it had become because I could have substituted trout for the whitefish. But Aunt Louise's gefilte fish "paté" turned out deliciously, as all my guests last night agreed, so the whitefish was worth the extra money. I "was" requested to bring a dessert. "THE Book of Jewish Food" An Odyssey from Samarkand to New York. "Gateau au Sirop d'Orange /Almond Cake in Orange Syrup. so it doesn't scorch or burn. The other thing so great about trying new things- is the knowledge I gained of the History of The Jews. Did you know- that Jews were Orange Farmers? they of course moved easily into other citrus-fruit farming. According to this cookbook- Jews became known as experts in citrus- in areas like Sicily and throughout The Mediterranean. Hombre de Acero wrote: Did you know- that Jews were Orange Farmers? There's big citrus farming in Jaffa. Perhaps too late for this year, but not too late for next year . . . or any time, but this recipe for braised chicken thighs with shallots via Sam Sifton and Andrew Zimmern is fantastic. I made it for a small family Passover Seder, substituting matzoh cake meal for the flour (note also it's not traditionally kosher if you use butter as called for). I used matzoh cake meal because it's ground much more finely, perfect for this use. Also, I know it gets repeated often, but always use a wine you'd be happy drinking. If you won't be happy drinking the wine, you won't be happy eating something cooked in it. Anyway, it was outstanding and everyone (who cooks) wanted the recipe. I also loved that it was very easy to prepare. 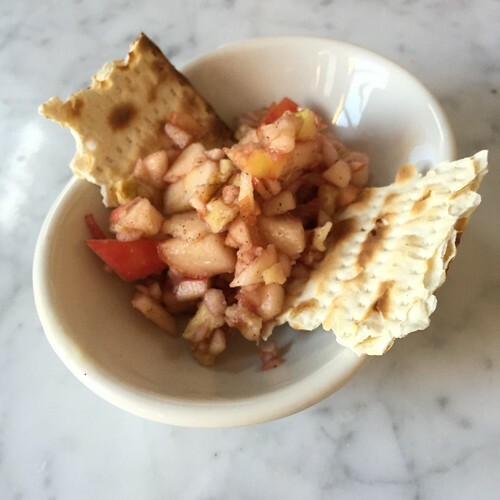 It's time for my sixth annual query about Seder menus and recipes. Making anything new and different? Perfected something old and beloved? Do share. Also, I'm interested in your Haroses recipes. I've tried different ones over the years but usually end up with the standard Ashkenazi apple/walnut/cinnamon/sweet wine one. Anyone have a knock-your-socks-off one? Our haroses/haroset has a bit of honey, adjusted to taste depending on the sweetness of the apples. And no cinnamon. I haven't done all my planning yet: Usually braised brisket and some sort of fish, everything else is brought by the rest of the family. With snowbirds still in Arizona, I don't know if we're getting matzoh ball soup, though. As usual, I am tasked to make gefilte fish. Gets more and more expensive every year. Will also make horseradish sauce from the raw root. Hopefully someone will be bringing matzo ball soup. My non-Jewish wife has no fond memories of it and does not look forward to it, but matzo ball soup fondly brings me back to my childhood. lougord99 wrote: Hopefully someone will be bringing matzo ball soup. My non-Jewish wife has no fond memories of it and does not look forward to it, but matzo ball soup fondly brings me back to my childhood. 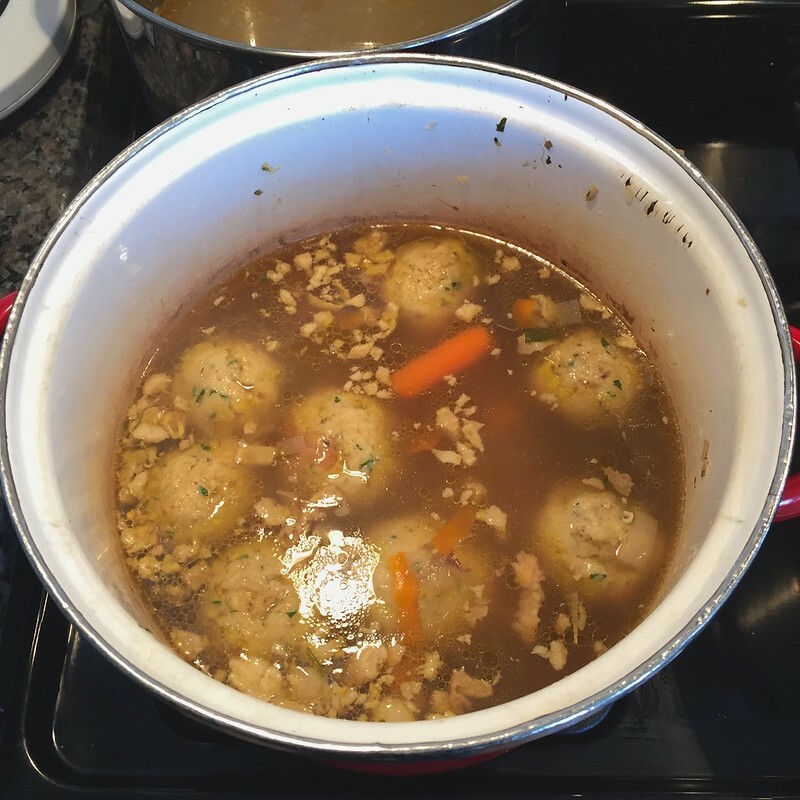 My brother makes the matzo ball soup every year from our mother's recipe. Unlike 90% of the world, we make our matzo balls from whole matzos that are briefly soaked in water and then squeezed out before being combined with egg and seasonings and then dried out in a frying pan. These matzo balls taste of matzo and have great texture but are not super dense. I can't wait! And I'm so glad he makes 'em, and I don't have to! Salmon & halibut terrine that's a riff on gefilte, Asian chicken soup with ginger-leek matzoh balls, braised brisket, a chicken dish tbd (maybe the clementine one from Jerusalem or perhaps the chicken & shallots discussed above; hard for me to get excited about this but we have some no-red-meat eaters), potato kugel (to my surprise, I really like Martha Stewart's version with sliced potatoes arranged on their edges), regular and beet horseradish from the root, homemade matzoh (did this last year so I guess the second time will make a tradition? ), Ashenazi haroset similar to those mentioned by Eva and Joel, and some dishes and desserts to be brought by guests. I'm considering adding 72-hour short ribs since we just got an Anova circulator and the Foodsaver vacuum sealer has shipped, but without a test run I'm nervous to skip the brisket and not have a meaty backup plan if they fail. Also probably need a couple more apps, if not offered by guests, as we eat those (the apps not the guests ) with sparkling wine pre-service as everyone is gathering. I've been saving a recipe for Aleppo meatballs, as a tribute to a guest from Syria, but I don't want to add more beef so would probably sub chicken or turkey. I made a Binny's run last week and stocked up on almost two cases of kosher for Passover (not mevushal) wine. For the first time, I saw actual K for P Champagne, so splurged on a couple of bottles of Pommery; has anyone tried these before? Happy Pesach to to all! Maybe we can serve (or make?) 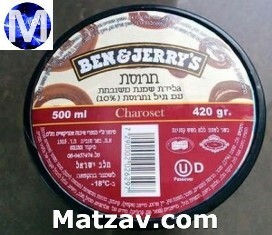 Charoset-flavored ice cream? EvA wrote: Maybe we can serve (or make?) Charoset-flavored ice cream? My sister made charoset gelato, said it's delicious, and now the challenge is keeping it in the freezer until next Friday. Unfortunately she, and more importantly, the gelato, are in Orlando. For them what care, there is gluten-free matzah meal and matzah cake meal at the Jewel on Howard in Evanston. Also many new (at least to me) varieties of KfP soda pop, including 1.5 liter bottles of Coke products that seem to be from Israel given the Hebrew labels. EvA wrote: Also many new (at least to me) varieties of KfP soda pop, including 1.5 liter bottles of Coke products that seem to be from Israel given the Hebrew labels. Any cans or small bottles of Coke this year? I saw no cans, but the plastic bottles--I think--included liter bottles too, at least for regular Coke. There are several displays in different places in the store of KfP pop. There were also brands of pop, perhaps Israeli, I've never seen before. LAZ indicated Hungarian Kosher on Oakton in Skokie always has Kosher Coke in cans. They are not locally bottled, they are trucked in from New York. She indicated they are rather pricey, too. "Always" as in "when available." This year it's only Pepsi in cans. That's been the issue for quite some time. Real sugar Coke in cans has been nearly impossible to find for the last few years. Luckily, the increased availability of Mexican Coke in bottles has lessened the sting. Smassey - care to share your recipe for Aleppo meatballs? I might make that for a second-pseudo Seder. For the main event, I am making gefilte fish for the second straight year. It turned out pretty well and is not difficult when you get the ground fish. gastro gnome wrote: Smassey - care to share your recipe for Aleppo meatballs? I might make that for a second-pseudo Seder. 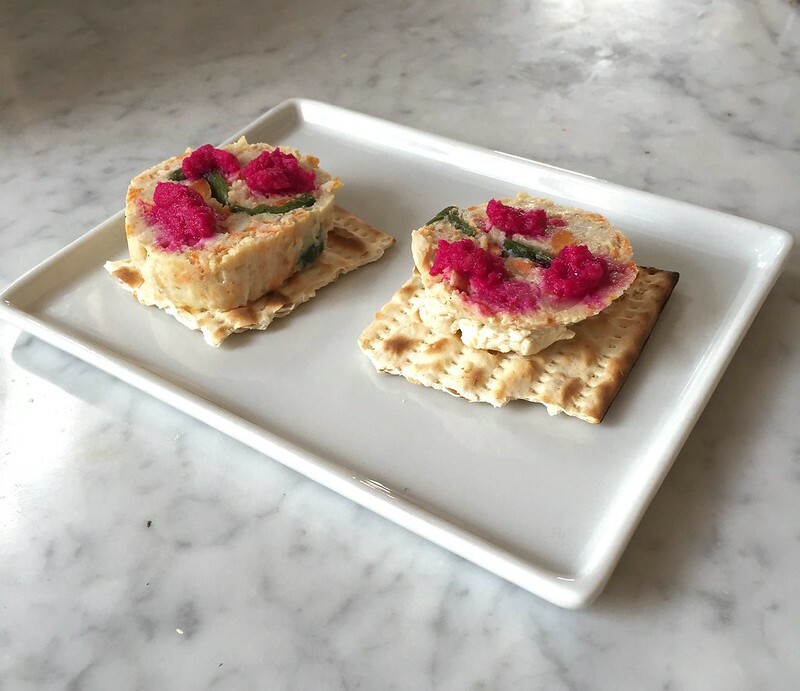 You know it's LTH when making gefilte fish is presented as easy! With the caveat that I haven't made it, and will probably tweak when I do, I have been eyeing Jennifer Abadi's recipe for Kibbeh m'Gerraz, from Fistful of Lentils. There are multiple links/posts available, and I just happened to have printed the one from Moment Magazine. When your fishmonger grinds it up for you the rest is pretty easy. My Passover Seder was the 1st I'd organized completely by myself. My Gefilte Fish that's made to look like Sushi when cut. The net effect is beautiful! May we all celebrate our FREEDOM! Gawrsh, as Goofy says, it’s my eighth year posting about Seder planning. We will be about 18 people this year, and it’s time to get serious about the menu. Some items are givens: my brother’s matzah ball soup, Aunt Louise’s gefilte fish “paté,” my mother’s hazelnut torte for dessert. With the hard-boiled eggs and salt water, that would be enough for a meal, but the Passover Seder is a feast celebrating our leaving the slavery of Egypt for freedom. Therefore, if you follow me, a full main course is necessary . We’ve been smoking a brisket the last few years, and may have to do it ahead the weekend prior, assuming this April snow ever stops. But I am considering my alternatives. Then there’s the potatoes and the veggies to choose. What are people doing this year? I appreciate the ideas in this thread and love to know what others are cooking. thread bump for this year! in other menu news, we are going rather mediterranean, with a mezze platter and cinnamon roasted carrots w fresh herbs, probably the great cauliflower kugel from bon appetit (http://www.bonappetit.com/recipe/caulif ... herb-crust), homemade coconut macaroons and matzoh crack. annak wrote: thread bump for this year! I've always been happy with smoked fish from Hagen's Fish Market on the Northwest Side; also the prices are pretty decent. The kugel sounds interesting. I'm still wavering on our menu. Smoking a brisket is out this year due to scheduling difficulties. I wish I had that perfect braised brisket recipe--that I believe is out there somewhere--but I don't, and I've tried many. So I'm considering falling back on an old friend, Chicken Marbella, as the entree protein because it's a pretty forgiving dish. GNR Kaufman's is my default for smoked fish and chubs, etc., but I noticed that the new deli at GNR Manny's had some real nice looking chubs in their case when I was there last week. Fish Time on Devon in Park Ridge smokes a variety of fish, including some fantastic whitefish.